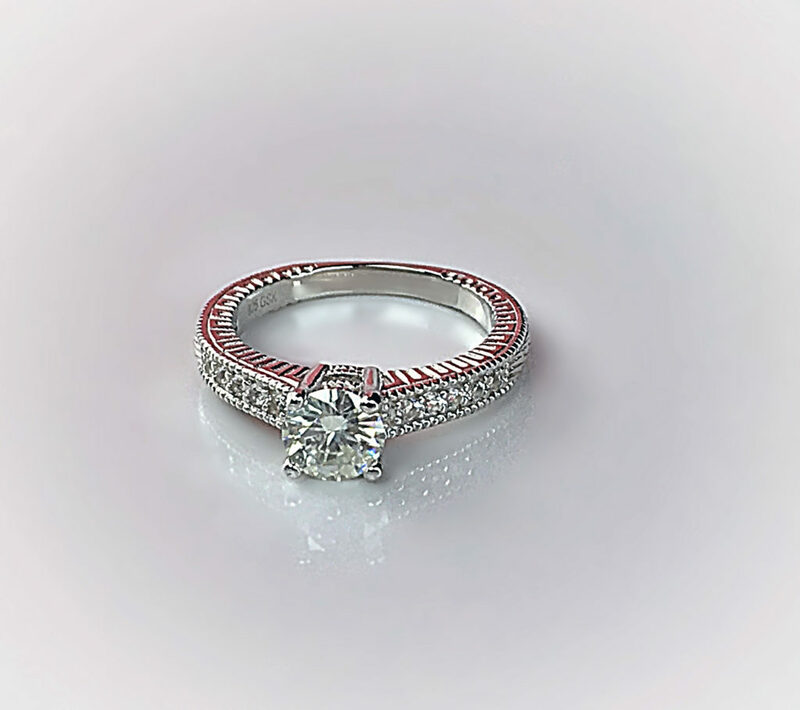 When it comes to engagement rings, the appeal of a diamond is undeniable: it’s sparkle, brilliance, fire, and clarity! But ethical and environmental concerns over diamond-mining cause many to seek a non-diamond alternative. There are beautiful colored gemstone engagement ring options, but if you love the traditional and classic look of a diamond, an outstanding conflict-free alternative is Moissanite. 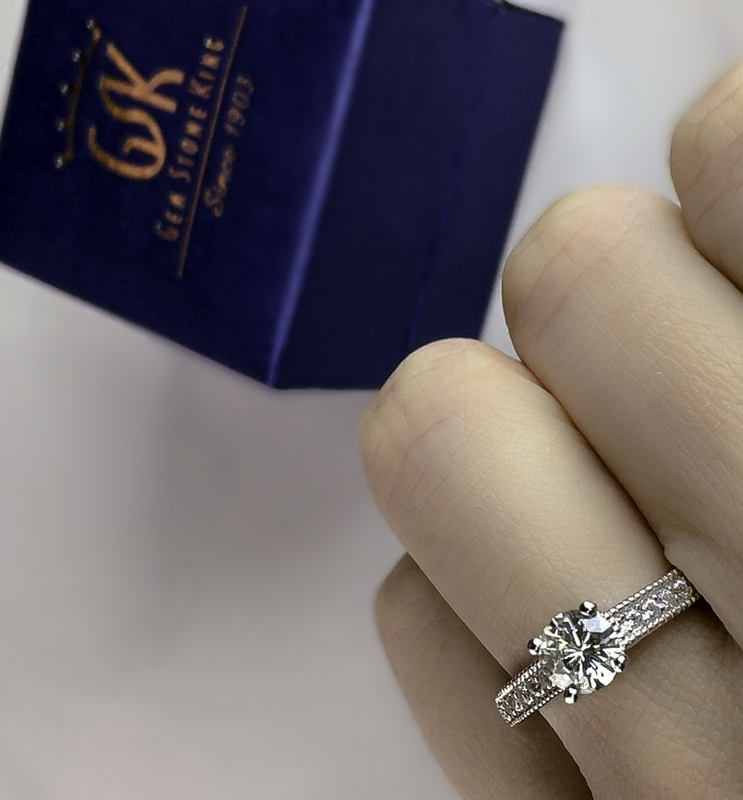 Gem Stone King combines the conflict-free Moissanite with a traditional diamond engagement ring setting that’s perfect for the classic but responsible woman: the Gem Stone King .925 Sterling Silver Solitaire with Accent Stones Created Moissanite Engagement Ring. Moissanite is a naturally occurring and chemically produced stone that structurally is an exceptional match for the look of a diamond. Moissanite is a conflict-free gemstone that is environmentally and ethically responsible. 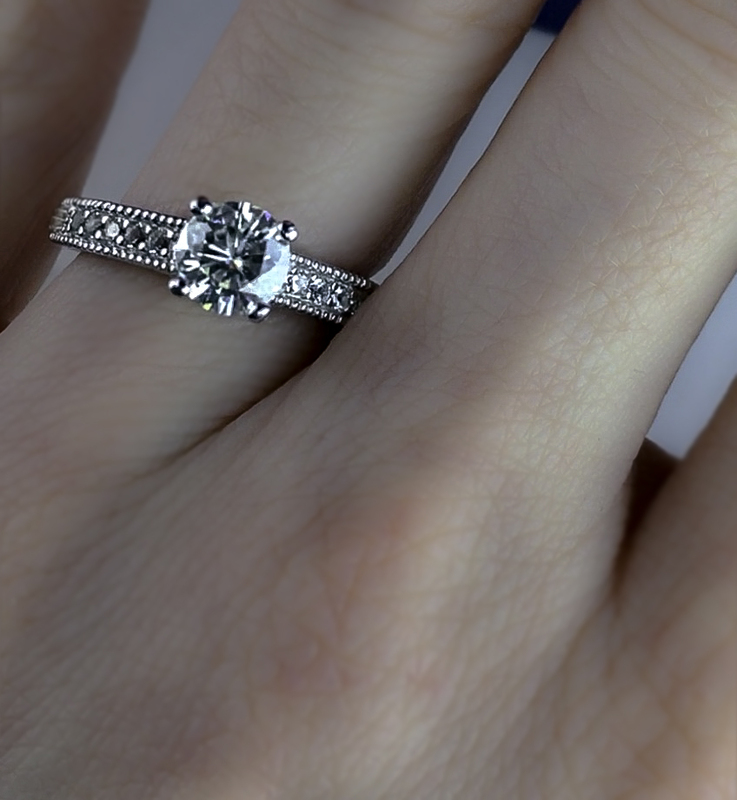 Created Moissanite emulates natural diamond characteristics so well that it easily fools the naked eye, especially when mounted on a traditional setting such as found on this Gem Stone King engagement ring. Created Moissanite has a particularly clear, flawless clarity. 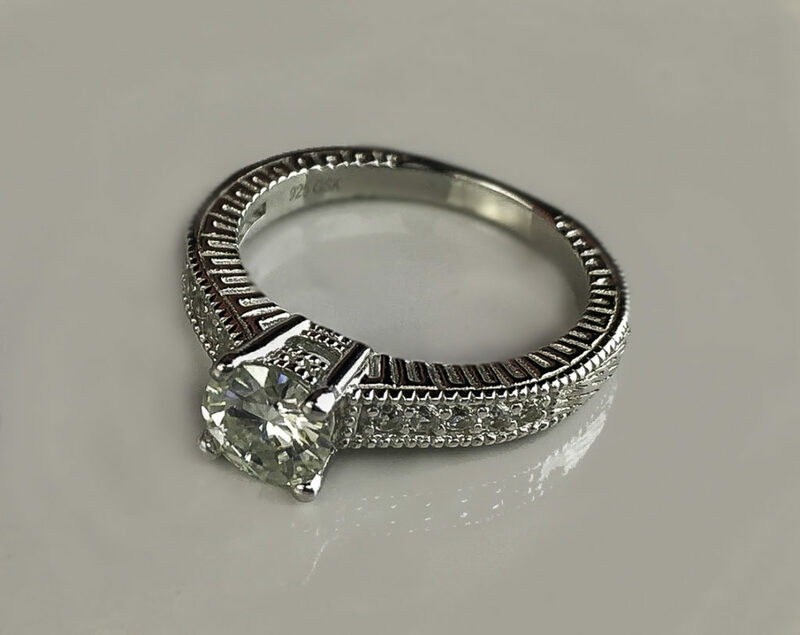 The result is a conflict-free, traditional diamond engagement ring look, and style but at a far more attractive price point than a diamond of the same carat size can offer. Of diamond alternatives, Moissanite is an excellent choice. Not only is this diamond alternative conflict-free, but its’ fire, clarity, and brilliance closely match the attributes of a natural diamond. Diamonds are so well loved mostly due to their unique brilliant sparkle, measured by something called a Brilliance Refraction Index. A diamonds’ Brilliance Refraction Index is higher than rubies, sapphires, and emeralds. Moissanite’s “Brilliance Refraction Index” just slightly brighter than a natural diamond, but not so bright as to look fake or too “blingy”. 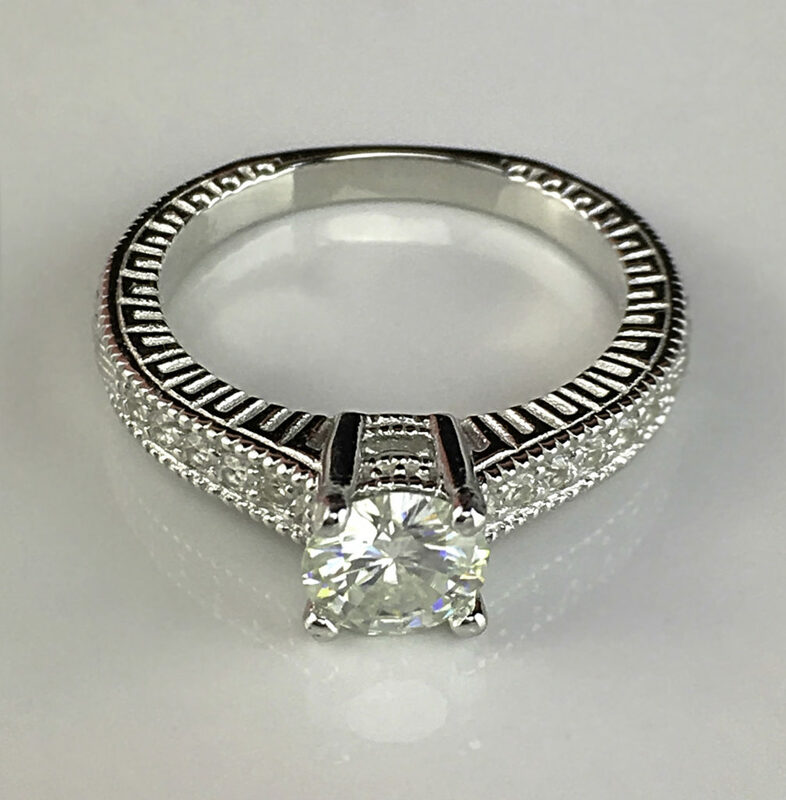 There is a natural elegance to natural and created Moissanite. There’s more fire (the dispersion of light or colored reflections seen when turning or tilting the stone) to a Moissanite than a diamond, giving the look of a high-grade, exceptional clarity diamond. Fire is often masked on darker gemstones, so if you want both high fire and a diamond alternative, Moissanite makes an ideal engagement ring choice. The chemical structure of both created and natural Moissanite is flawless in terms of having little to no visible cloudiness, inclusions, irregularities or blemishes, resulting in a clarity comparable to a high-grade diamond but without appearing so transparent as to look fake or glass-like. Moissanite is slightly less hard as a diamond but harder and more durable than other non-diamond engagement stones such as rubies, emeralds, and sapphires. The cut is timeless brilliant round, which gives the most sparkle. The stone is IJK which is a faint color classification. 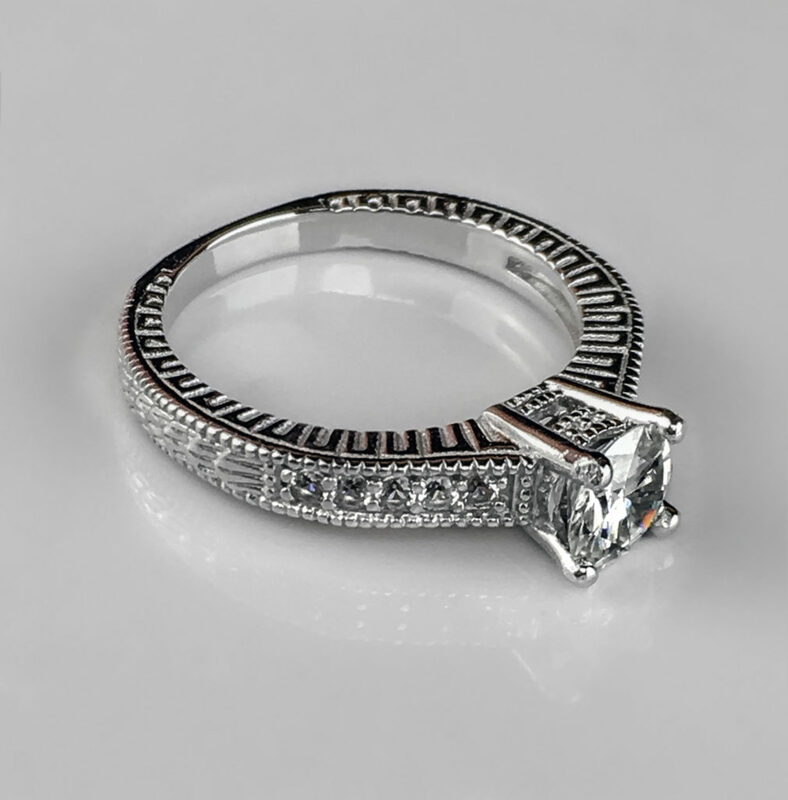 It is held in a four prong setting to lend a traditional diamond link. 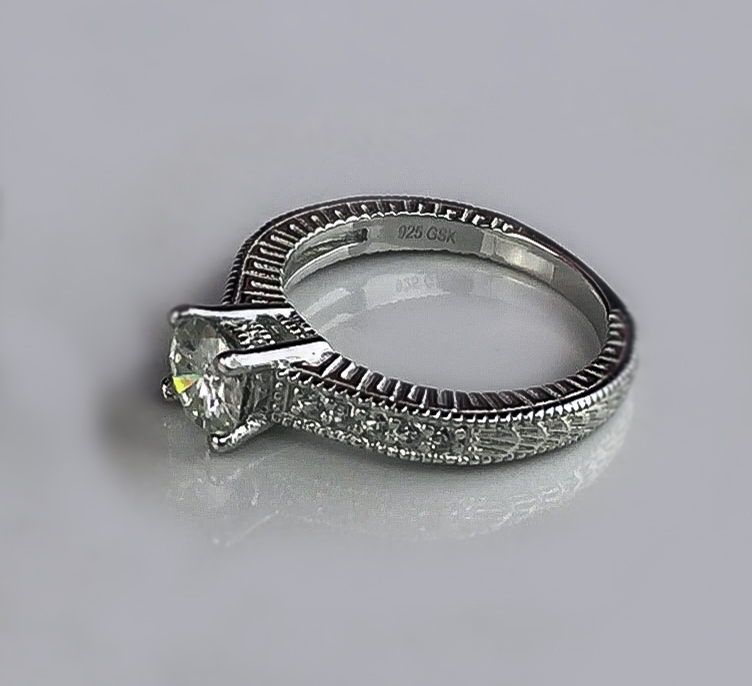 It has a DEW (Diamond Equivalent Weight) of almost one carat (.95). 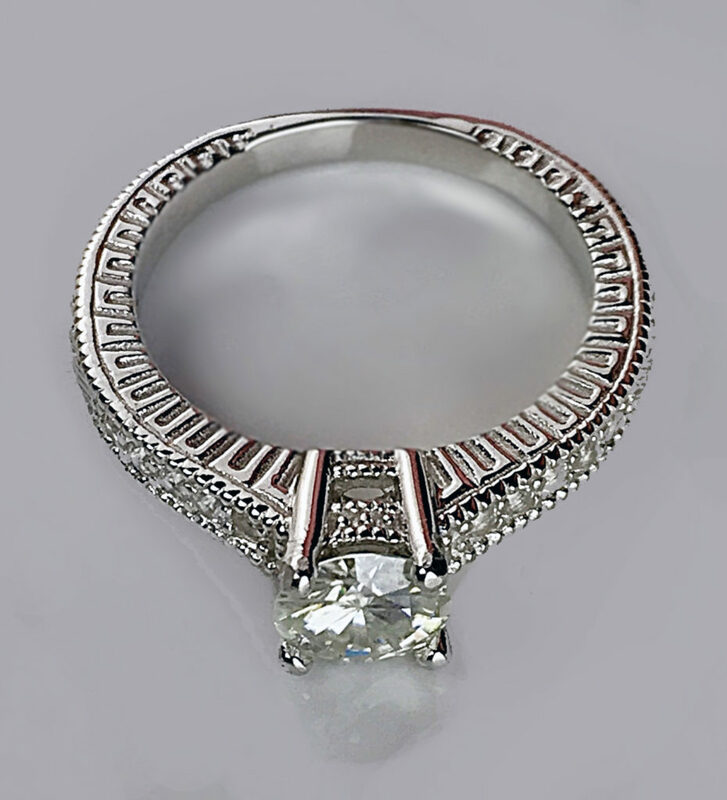 It has an exceptionally diamond-like look with lovely sparkle. I like the modern yet classic look. The size of the stone feels just right to me, understated but not chintzy looking or too gaudy or large. 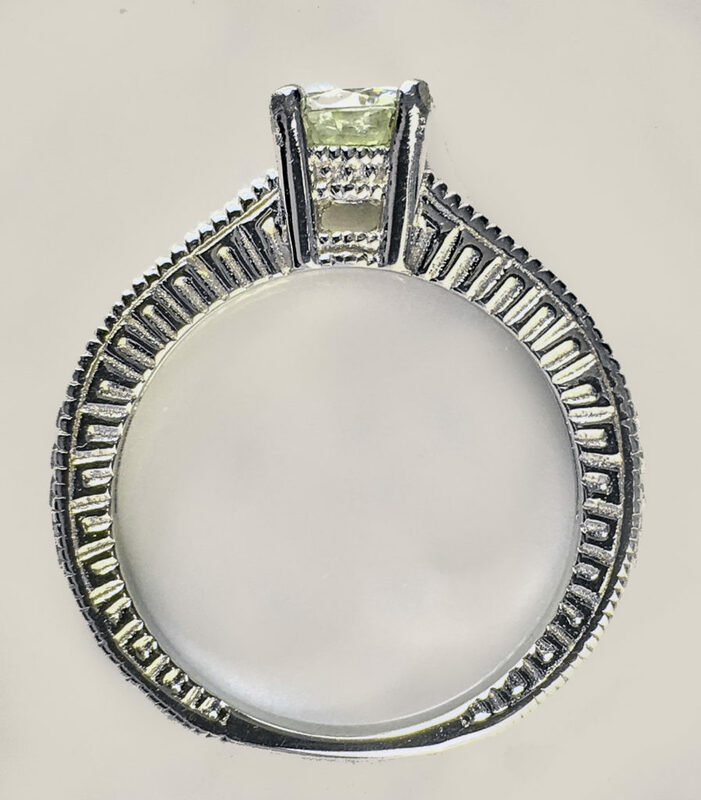 The ring has ten side stones embedded in the band, five on each side. These stones are eye clean, round cut Cubic Zirconia. The smaller side stones are each 1.5 mm wide and long. Small Cubic Zirconia side stones work well with a Moissanite focal gemstone. While Cubic Zirconias lack the brilliance of a Moissanite, (that colorless light sparkle), they do hold have that rainbow fire, especially with the right cut. This rainbow fire on these round cut smaller stones lends a nice subtle but eye-catching sparkle. The band is .925 Sterling Silver that has a modern yet timeless engraved pattern and a traditional white gold look. The high shine compliments the brilliant sparkle of the embedded side stones and the focal stone. The Gem Stone King family has been in the diamond business for over 100 years. All Gem Stone King diamonds are conflict-free from authorized sources with a Kimberley certificate. As a New York City-based diamond wholesaler, Gem Stone King oversees local production to keep costs low while employing old world methods with modern technology. They sell jewelry online directly to consumers. Because of this, they offer a much higher quality item that is typically seen for the price point. While there are many environmentally and socially conscious conflict-free engagement ring options available, few offer the look of a traditional diamond as well as this Gem Stone King Moissanite Engagement Ring does. 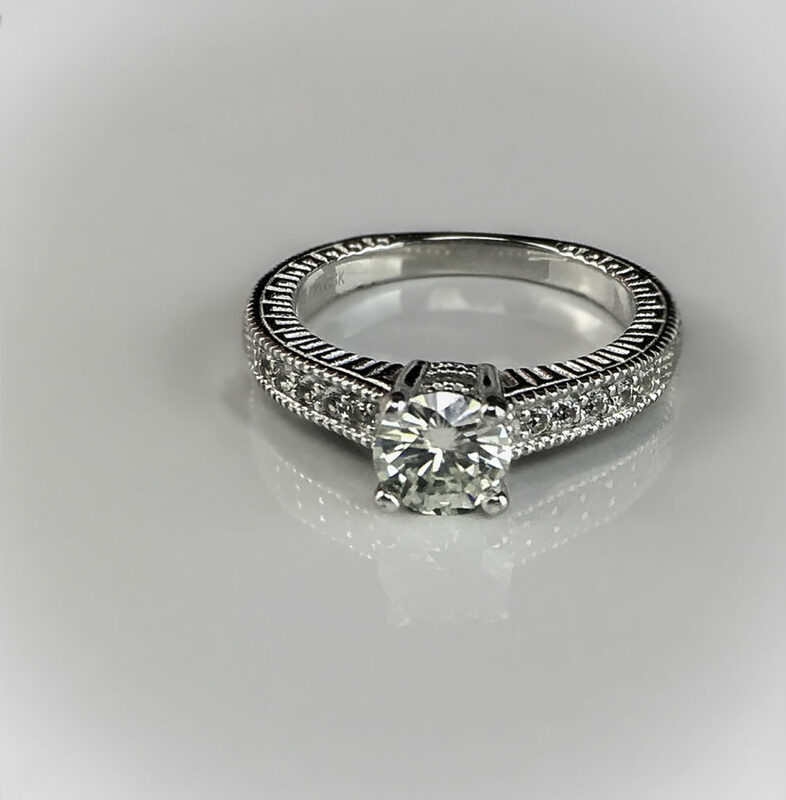 It is conflict-free without forsaking any of the timeless diamond features of fire, brilliance, durability, clarity, and sparkle that are typically seen in a classic style engagement ring. 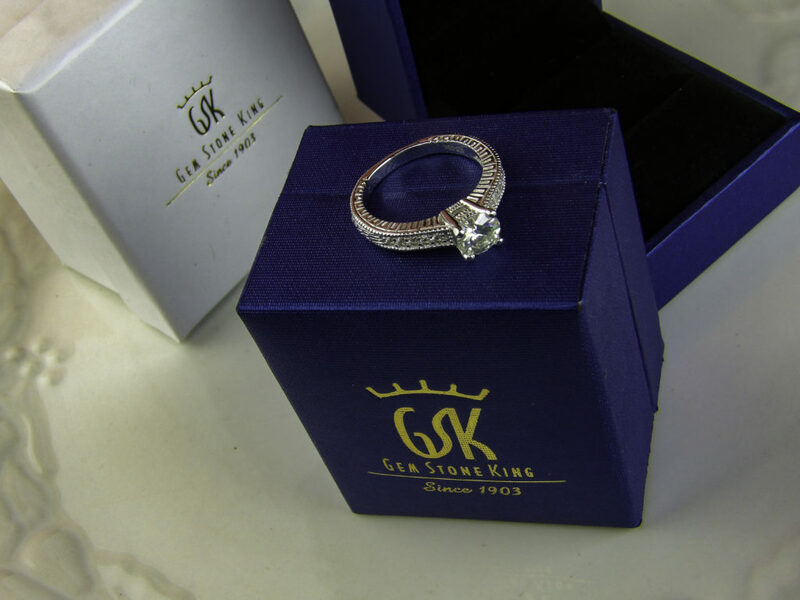 Style Chicks received the Gem Stone King 925 Sterling Silver Solitaire with Accent Stones Created Moissanite Engagement Ring in exchange for our unbiased review and received compensation for our time and effort. However, our experience with the product and the opinions expressed in this review are 100% ours.